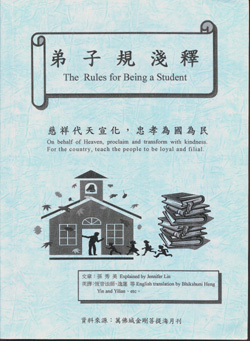 "Standards for Students" is a compilation based on Confucian Analects. It contains practical lifestyle rules extracted from daily life. This book uses the format of "three words for one sentence, two sentences for one rhyme," thus it is very suitable for children to read and recite. Because of these simple, yet thought-provoking examples, it is a guideline for adults to cultivate and self-improve in today's society. The Chinese and English versions of "Standards for Students" and the "Three Character Classic" are required reading materials for students at Goodness Instilling Elementary School in the City of Ten Thousand Buddhas, CA. Many interesting, yet profound short stories are used by the school's volunteer teacher, Jennifer Lin, to annotate "Standards for Students" and it has been translated into English in the Vajra Bodhi Sea Monthly Journal. We hope all disciples and students from the East and West will have the opportunity to read and benefit from this book.